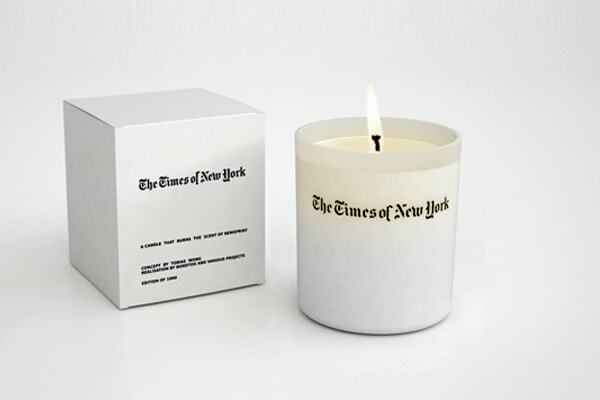 For those who cannot part with the smell of newsprint, I present The Times of New York scented candle. It's the work of Tobias Wong, a newspaper addict and lover of the NTTimes. It has a scent described as "newsy, with hints of guaiacwood, cedar, musk, spice, with "a powdery note and velvet nuance," meant to mimic the aroma of black ink on newsprint. " It's being sold in a limited production run of 1 thousand, and it will set you back $65 (here, here). uh, but for the 65 bones, i might’ve given it a try, just for fun. but $65! ee-gad.